A spherical source, one of the simplest seismic sources, has been represented in various ways in the literature. These representations include a spherical source with outward radial expansion (S1), a spherical crack source with outward and inward crack wall motions along the spherical surface (S2), an isotropic source represented by three mutually perpendicular vector dipoles (S3) or three mutually perpendicular tensile cracks (S4), and a spherical source undergoing a transformational expansion (S5). We systematically examined these sources and their static displacement fields to clarify how these representations are mutually related. We also considered the sources in a bimaterial medium, in which the source material is different from the surrounding medium, as a model of a magma or hydrothermal reservoir. Our examinations show that the source volume change of a spherical source (S1) (actual volume) can be uniquely determined from the seismic moment of an isotropic source (S3) regardless of our assumption of the source medium and that the actual volume of S1 is related to the seismic moment of S3 through the equivalence of the displacement fields due to these two sources. The seismic moment of S3 is also related through another equation to the source volume change of three tensile cracks (S4), which is equal to the source volume changes defined in S2 and S5. This relation has different forms, depending on the source medium and source process. This study provides a unified view for quantifying a spherical source using the seismic moment of an isotropic source determined from waveform inversion analysis. Spherical and cylindrical volume changes have been considered as sources of volcano seismic signals (e.g., Kanamori et al. 1980; Fukuyama and Takeo 1987; Uhira and Takeo 1994; Dreger et al. 2000; Legrand et al. 2000; Tameguri et al. 2002; Ohminato et al. 2006; Maeda and Takeo 2011; Kumagai et al. 2011). 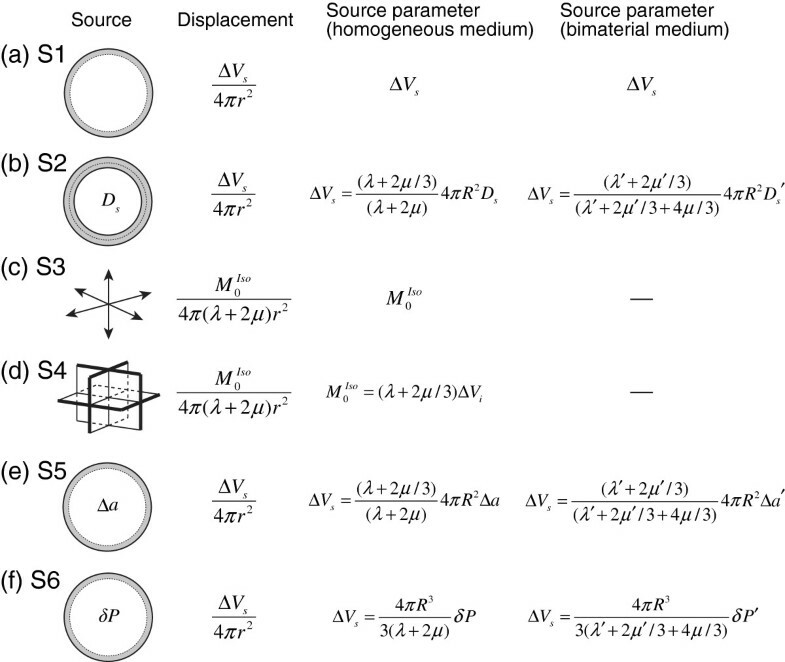 Although a spherical source is one of the simplest seismic sources, there are various ways to represent it. These representations include a spherical source with outward radial expansion (e.g., Mogi 1958) (S1, Figure 1a), a spherical crack source of Müller (2001) (S2, Figure 1b), an isotropic source represented by three mutually perpendicular vector dipoles (S3, Figure 1c) or three mutually perpendicular tensile cracks (S4, Figure 1d), and a spherical source undergoing a transformational expansion based on the concept of imaginary cutting, straining, and welding operations of Eshelby (1957) as introduced by Aki and richards (2002), which we call an Eshelby spherical source (S5, Figure 2a). Source representations. 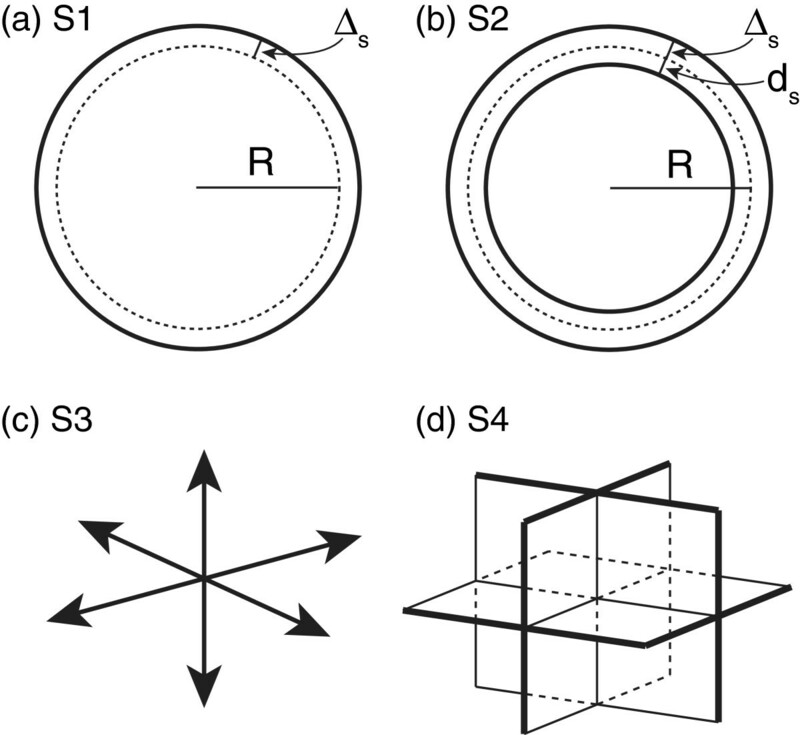 (a) A spherical source with purely outward radial expansion of Δs (S1), (b) a spherical crack source with outward and inward displacements (Δs and ds, respectively) along the spherical surface (S2), (c) an isotropic source with three mutually perpendicular vector dipoles (S3), and (d) a superposition of three mutually perpendicular tensile cracks (S4). Spherical source with stress-free strain and strain-free stress. (a) Schematic view of a spherical source undergoing a transformational expansion (S5) based on imaginary cutting, straining, and welding operations of Eshelby (1957). (b) A spherical source in which a strain-free stress or pressure (δ P) is applied to the removed source volume (S6) (see text for details). where λ and μ are Lamé’s constants and ΔVs and ΔVf are two different definitions of source volume changes (see below). The recent volcano seismology literature has used Equation 1 (e.g., Kawakatsu and Yamamoto 2007; Kumagai 2009; Chouet 2013), whereas earlier studies generally used Equation 2 (e.g., Chouet 1996; Julian et al. 1998; Dreger et al. 2000; Nishimura and Iguchi 2011). According to Kawakatsu and Yamamoto (2007), the volume change in Equation 2 (ΔVf) corresponds to the stress-free volume, introduced by Eshelby (1957), whereas the actual volume in Equation 1 (ΔVs) may be smaller than the stress-free volume because of the confining pressure of the surrounding medium. Kawakatsu and Yamamoto (2007) also noted that the actual volume corresponds to the volume change used in the Mogi model (e.g., Mogi 1958). Müller (2001) noted that the discrepancy between Equations 1 and 2 could not be resolved, and he interpreted these two forms to correspond to the limits of the actual volume of the source. Wielandt (2003) discussed the discrepancy and noted that the source volume change depends on the source geometry. Richards and Kim (2005) argued that each relationship is based on a different definition of volume changes at the source and that Equation 1 is preferred for characterizing underground explosions. It is not clear why a spherical source has been represented in different ways and how these representations, including the two seismic moment equations, are mutually related. In Eshelby’s operations and Müller’s spherical crack, the source material is assumed to be the same as the surrounding medium. In volcanic regions, sources may be filled with magmatic or hydrothermal fluids. No examinations have been made on a spherical source in such bimaterial media, although the source representation of fault slip on a bimaterial interface has been discussed in various studies (e.g., Ampuero and Dahlen 2005). 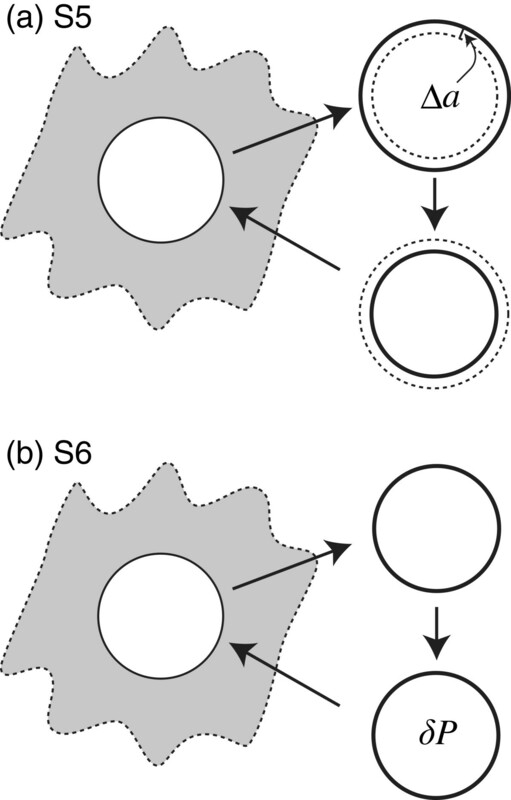 In this paper, we first review the spherical source representations mentioned above and then derive the static displacement fields due to these sources in an infinite medium and in a half-space. We compare the analytical forms of these displacements to clarify the relationships among these representations. We further examine a spherical source in a bimaterial medium, which is of fundamental importance as a model of a magma or hydrothermal reservoir. Source coordinates for (a) a crack and (b) a spherical source in a half-space. Δ V D = 4 π R 2 D s = 4 π R 2 d s + Δ s .
where ΔVs = 4π R2Δs. M 0 Iso = ( λ + 2 μ / 3 ) Δ V i . Here, ΔVi = 3ΔVc, where ΔVc is the incremental change in the volume of each crack. M 0 = ( λ + 2 μ ) Δ V s .
where ur is the radial displacement. We denote the regions inside and outside the sphere with radius R as regions 1 and 2, respectively. Equation 11 has two solutions: ur = A r and ur = B/r2, where A and B are constants. The former is the interior solution for region 1 (r ≤ R), and the latter is the exterior solution for region 2 (r ≥ R). = ( λ + 2 μ ) 2 π ( λ + μ ) Δ V s r 2 .
respectively, where c is the source depth and d is the horizontal source distance (Figure 3b). Equations 18 and 19 represent the displacement field of the Mogi model (Mogi 1958). Comparing Equation 17 for a half-space with Equation 15 for an infinite medium, we find that these two equations differ by a factor of 2(λ + 2μ)/(λ + μ) (Figure 4a). For this consideration, we used ΔVs = 4π R2Δs, in which neither the stress-free volume nor Eshelby’s operations are introduced. 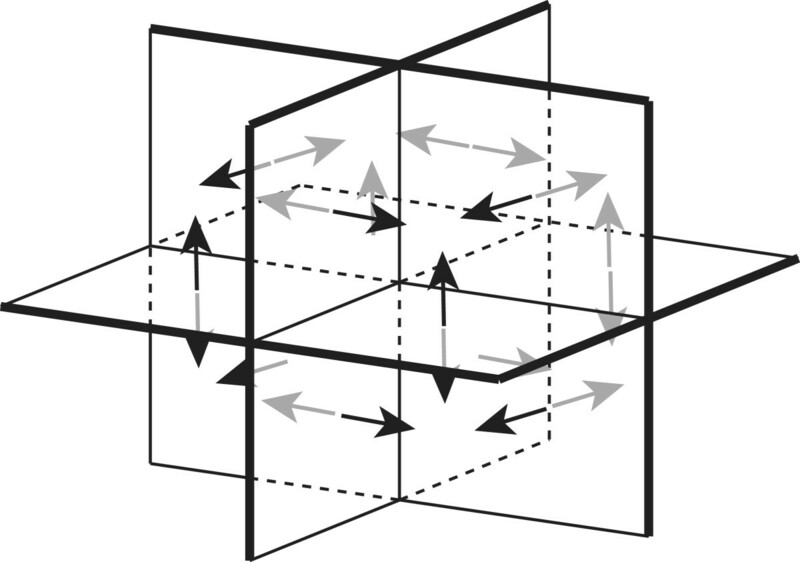 Static displacement fields. These fields are due to (a) a spherical source (S1) and (b) an isotropic source (S4) in an infinite medium and in a half-space. Δ s = ( λ + 2 μ / 3 ) D s ( λ + 2 μ ) . Δ V s = ( λ + 2 μ / 3 ) ( λ + 2 μ ) Δ V D .
Here, ΔVD = 4π R2Ds. u r = M 0 Iso 4 π ( λ + 2 μ ) r 2 .
u r = ( λ + 2 μ / 3 ) 4 π ( λ + 2 μ ) Δ V i r 2 .
u r = ( λ + 2 μ / 3 ) 2 π ( λ + μ ) Δ V i r 2 . Comparing Equation 28 with Equation 29, we find, as in the spherical source or Mogi model (Equations ?? and 17), that they differ by a factor of 2(λ+2μ)/(λ+μ) (Figure 4b). σ rr i = - ( λ + 2 μ / 3 ) 3 Δa R .
σ rr i = σ rr e = - ΔP. Δ V s = ( λ + 2 μ / 3 ) ( λ + 2 μ ) Δ V f .
Here, ΔVf = 4π R2Δa. Comparing Equation 34 with Equation 25, we see that Ds = Δa. σ rr i = - δP. Δ V s = 4 π R 3 3 ( λ + 2 μ ) δP. We note that δ P is the applied pressure, which may correspond to the stress glut (Backus and Mulcahy 1976), and ΔP is the pressure after the equilibrium state. We consider a bimaterial medium, in which Lamé’s constants are λ′ and μ′ in region 1 and λ and μ in region 2. This medium may be viewed as a model of a magma or hydrothermal reservoir, and its source representations are critically important to understand volcanic processes. For a spherical source (S1), no assumption is made on region 1, and the boundary conditions at r = R in a bimaterial medium are given as those in a homogeneous medium (Equations 12 and 13). Therefore, the displacement field is the same as in a homogeneous medium given in Equation 15. For an isotropic source, three vector dipoles (S3) can be represented as three tensile cracks (S4). For the moment tensor of each tensile crack, no assumption is made for the material inside a tensile crack, and we may not able to define an isotropic source in a bimaterial medium. where V D ′ = 4 π R 2 D s ′ . σ rr i = - ( λ ′ + 2 μ ′ / 3 ) 3 Δ a ′ R .
where Δ V f ′ = 4 π R 2 Δ a ′ . Δ V s = 4 π R 3 3 ( λ ′ + 2 μ ′ / 3 + 4 μ / 3 ) δ P ′ . 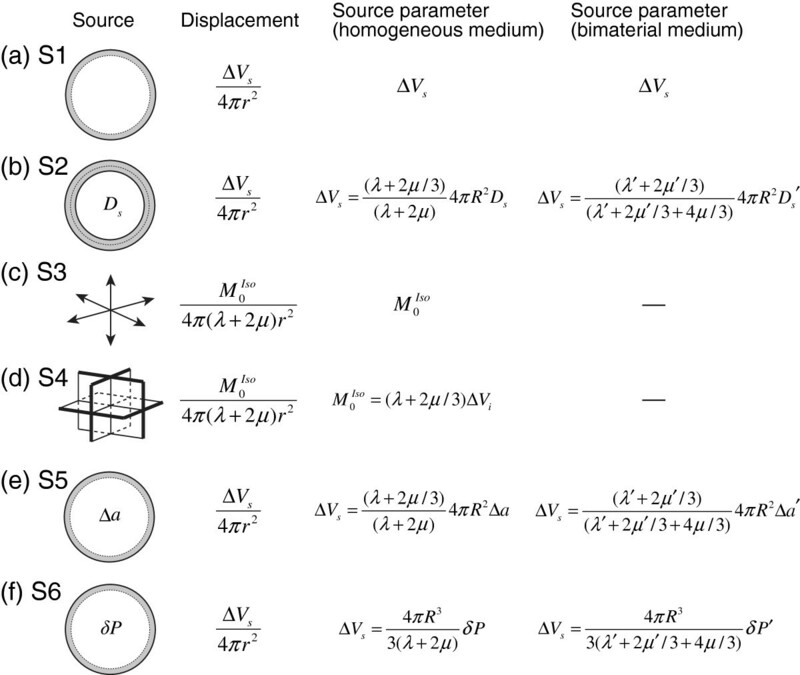 Summary of displacement fields and source parameters in homogeneous and bimaterial media for various sources. (a) A spherical source (S1), (b) a spherical crack source (S2), (c) an isotropic source (three mutually perpendicular vector dipoles) (S3), (d) an isotropic source (three mutually perpendicular tensile cracks) (S4), (e) an Eshelby spherical source with stress-free strain (S5), and (f) an Eshelby spherical source with strain-free stress (S6). Δ V s = M 0 Iso ( λ + 2 μ ) . where ΔVf = 4π R2Δa = 4π R2Ds. We see from Equations 50 and 51 that ΔVi = ΔVf: the sum of three tensile crack volumes is equal to a spherical crack volume or stress-free volume. Therefore, the two seismic moment equations (Equations 1 and 2) can be understood as follows: the first equation from the equivalence of the displacement fields due to a spherical source (S1) and an isotropic source (S3) (Equation 49) and the second equation from the equivalence of three tensile crack volumes and a spherical crack volume or stress-free volume (Equations 50 and 51). 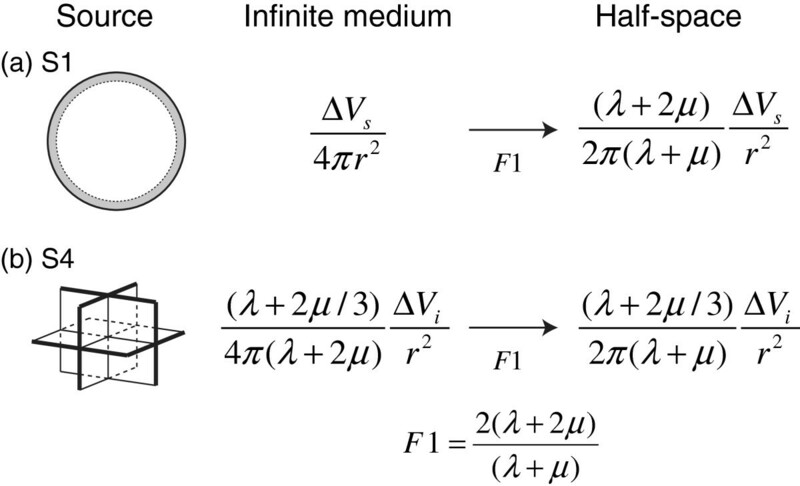 The first equation can be used to estimate the actual volume from the seismic moment of an isotropic source (S3). As shown in Subsection 'Sources in a bimaterial medium’, no assumption is made on region 1 for a spherical source (S1), and its source parameter is given as ΔVs in both homogeneous and bimaterial media (Figure 5a). Thus, we may use Equation 49 with M 0 Iso in a homogeneous medium to estimate ΔVs, regardless of the assumption on the medium. M 0 Iso = 4 π ( λ + 2 μ ) R 3 3 ( λ ′ + 2 μ ′ / 3 + 4 μ / 3 ) δ P ′ . These results suggest that the source estimation in region 1 depends on our interpretation, whereas we can uniquely estimate the source parameter of ΔVs in region 2 from M 0 Iso . In volcano seismological studies, waveform inversions have been performed to determine moment tensor solutions. If one interprets the isotropic source determined by waveform inversion to be spherical, then Equation 49 can be used to estimate the actual volume ΔVs. In volcano geodetic studies, the Mogi model has been used to interpret volcano deformations. Because the Mogi model is based on a spherical source, ΔVs is estimated directly. On the other hand, Okada (1992) model uses an isotropic source. Thus, if one estimates the seismic moment of an isotropic source by using Okada’s model, the relation given in Equation 49 should be used to estimate the volume change due to the corresponding spherical source or Mogi model. 4 π r 2 u r = Δ V s .
4 π r 2 u r = ( λ + 2 μ / 3 ) ( λ + 2 μ ) Δ V i . This relation indicates that the source volume change is not conserved. The non-conserved volume may be attributed to compressed volumes in regions close to the cracks (Figure 6). The non-conserved volume is equal to the spherical crack volume or stress-free volume, although the reason why these volumes are equal is not clear. 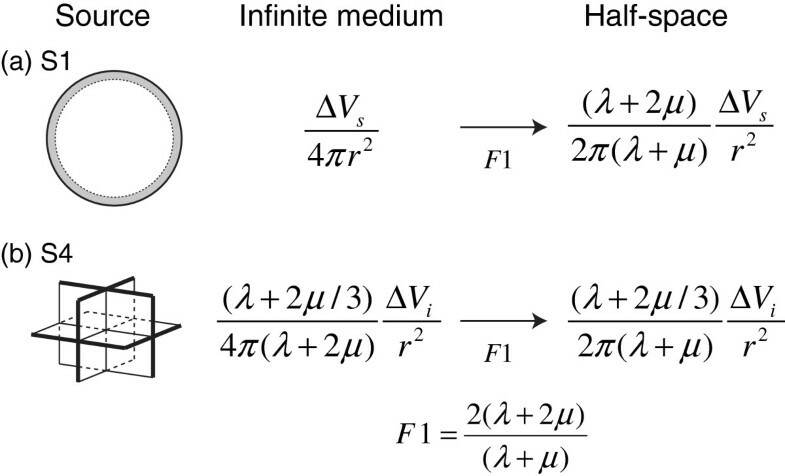 We note that the conservation of a source volume does not hold for displacement fields in a half-space because of the effect of the free surface. Force systems for three mutually perpendicular tensile cracks. σ rr e - σ rr i = - 4 μ R 3 B - ( 3 λ + 2 μ ) A = - ( ΔP + Δ P ̄ ) . u r e = R 3 ( λ + 2 μ ) ( ΔP + Δ P ̄ ) + ( λ + 2 μ / 3 ) ( λ + 2 μ ) ( Δ s + d s ) R r 2 . Δ P ̄ = - ( 3 λ + 2 μ ) d s R .
u r e = R 3 ( λ + 2 μ ) ΔP + ( λ + 2 μ / 3 ) ( λ + 2 μ ) Δ s R r 2 . From Equations 57 and 58, we see that Equation 65 becomes Equation 15 for the displacement field due to a spherical source. Therefore, Equation 65 may be regarded as the general form of the equation for the displacement field due to a spherical source represented by ΔP and Δs. We systematically examined the following seismic sources and their static displacement fields: a spherical source (radius R) with outward radial expansion (R + Δs) (S1), a spherical crack source with outward and inward crack wall motions along the spherical surface with displacement discontinuity Ds (S2), an isotropic source represented by three mutually perpendicular vector dipoles (S3) or three tensile cracks (S4), and an Eshelby spherical source undergoing a transformational expansion (R + Δa) (S5) or strain-free stress (δ P) (S6). Our examinations show that the static radial displacement fields due to these sources except for an isotropic source are given as ΔVs/(4π r2), where ΔVs = 4π R2Δs is the actual volume. The equivalence of these fields and that due to an isotropic source (S3) gives Δ V s = M 0 Iso / ( λ + 2 μ ) , where M 0 Iso is the seismic moment of an isotropic source. The actual volume ΔVs may be uniquely determined from M 0 Iso in homogeneous and bimaterial media. We see that the source volume change for an isotropic source defined by three tensile cracks (S4) is equal to the spherical crack volume (4π R2Ds) and stress-free volume (4π R2Δa). We then obtain M 0 Iso = ( λ + 2 μ / 3 ) Δ V f , where ΔVf is the spherical crack or stress-free volume. This relation depends on our interpretation of the source process. If we consider an Eshelby spherical source with strain-free stress (S6), M 0 Iso is related to δ P. We obtain a different estimation of ΔVf or δ P in a bimaterial medium. This study provides a unified view for quantifying a spherical source using the seismic moment of an isotropic source determined from waveform inversion analysis in volcano seismological studies. We thank Mare Yamamoto, Minoru Takeo, and Shiro Hirano for their useful discussions. This work was supported by the Japan Science and Technology Agency (JST). HK developed the main framework of the study and drafted the manuscript. All authors carried out the theoretical considerations and read and approved the final manuscript.